Packaging your items seems simple enough, but ensuring that a shipment’s contents are sufficiently insulated from impacts and other sources of damage are important steps in the shipping process. In fact, packages that don’t conform to the ISTA 3A shipping standard (more on that later) are considered “ship at your own risk” and aren’t eligible for insurance or even the refund on the shipping fees if anything were to occur. Taking the time to securely package the contents of a shipment reduces the risk of damage while also giving you the peace of mind that comes from knowing any unforeseen issues will be covered by insurance. If you’re looking for information on how to ship a specific item, the Packaging Advisor from UPS gives recommendations based on the given contents along with the size and weight. Here, we’ll cover some tips applicable to all shipments, as well as how to package your items to meet the ISTA 3A. How Well Do I Need To Package My Items? Secure packaging is important for any shipment, but that’s especially true when shipping insurance is involved. Poor or inadequate packaging will invalidate any insurance and you will not be eligible for any refunds on the transportation costs. Even if you are eventually successful in your insurance claim, damaged or lost packages can take up to a month to resolve (if not longer!). If you’re not confident in your ability to safely package an item, especially if it’s expensive or fragile, there are companies who will take on that responsibility, but that shouldn’t be necessary in most situations. With a little knowledge, you’ll be able to package your items to meet the ISTA 3A standard, required for all insurance claims. Is My Box Strong Enough? 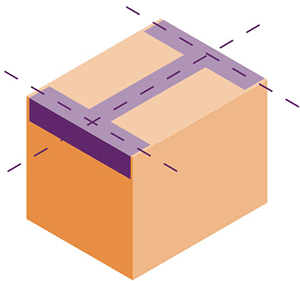 Boxes endure a lot during shipping, including drops, bumps, and collisions of all kinds. Therefore, it’s important to make sure you’re using the right box for the job. 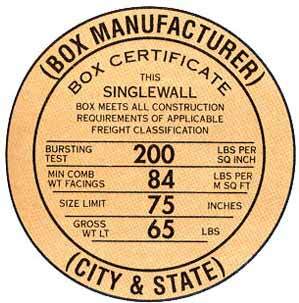 At the bottom of every box, you’ll see a seal displaying its maximum strength-an example seal is shown below. If your items exceed those limits, you’ll lose your eligibility for insurance, and the contents will be substantially less secure. However, once a box has been used, those numbers no longer apply—according to UPS*, it is not uncommon for used boxes to lose 50% of their original strength after their first use. They’re also substantially more likely to be damaged during shipping, so a new box is required under the ISTA 3A, meaning it’s mandatory for any package you want to insure. Shipping insurance is covered extensively in Shipping 201 . Aside from used boxes, claims will be denied for any items shipped in duffel bags, plastic bins, luggage, or anything that isn't packaged in a cardboard box. How Much Packaging Material Do I Need? Packaging materials are intended to surround the shipment’s contents while absorbing impact and acting as a buffer. Some of the most common materials available include bubble wrap, packing peanuts, and Kraft paper. They’re meant to be placed either between items or between an item and the box. Regardless of the packaging material, the ISTA 3A requires at least 2 inches of padding between items, as well as between items and the box itself. For highly fragile items, you must use a second box for further insulation. It should be at least six inches taller, longer, and wider than the original, and the gap should be filled with packaging material. If you’re not sure about your packaging of a fragile item, you can find more information here. If there are multiple items in the same box, you should wrap each of them separately. They’ll move within the box during shipping, so simply putting packing peanuts or Kraft paper between them isn’t enough. The best material for individual items is small bubble wrap, which will conform to each one’s shape and lessen the force of any impacts. Ensuring at least 2 inches of padding between items and the box (as well as between each item) is critical for meeting the ISTA 3A standard. Even if your package isn’t insured, it’s still an effective guideline for safe shipping. The closer the contents are to the box itself, the more they’ll be affected by sudden bumps and movements. When sealing your package, it’s important to use tape that’s strong enough to withstand pressure. FedEx recommends pressure-sensitive plastic tape, water-activated paper tape, or water-activated reinforced tape. They have a pretty good packaging guide here. The H-taping method (shown above) is the best way to secure your box at the seams. If you’re double-boxing, don’t forget to tape both boxes. Do not use duct tape, masking tape, rope, or string to seal packages. Certain specialty items, such as perishables, art, and plants, may need to be shipped in a specific way, so check your carrier’s website if you’re unsure. Ensure 2” of padding between each item within the box. Ensure 2” of padding between the items and the wall of the box. Once you drop off your package or have it picked up by a carrier, its fate is out of your hands, so you should do as much as possible to ensure its safety and security throughout the shipping process. This starts with the basics: a sturdy, new box and sufficient packaging materials. Following the requirements with respect to shipping labels and other documents will also lower the risk of setbacks. Secureship’s Learning Center has all the information you need to improve the reliability, speed, and cost of your business’s shipping. Go on to Shipping 103 learn about the various shipping weights, including dimensional and billable weight. 103: Weight? Dimensional Weight? Billable Weight?